One paradox that is faced in the US is that temperatures reported to the public are most often in degrees F, however, analysis charts, forecast panels, and Skew-T plots use degrees C. One must readily be able to translate a Celsius temperatures to a Fahrenheit temperature and vice versa. The 4 dimensions are length, width, height and time. 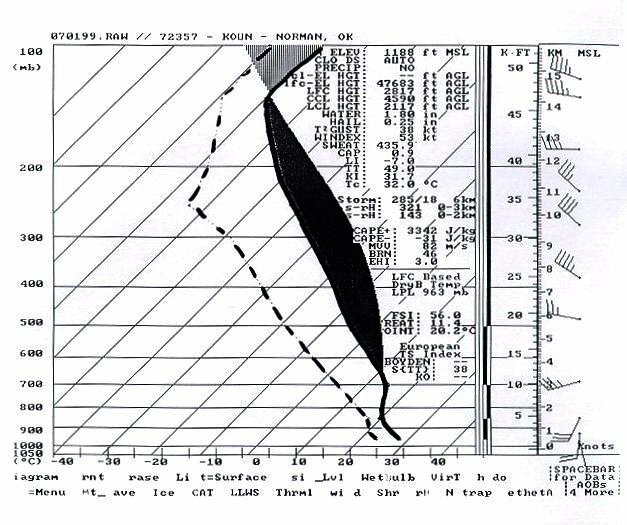 *When looking at a composite of analysis charts and forecast panels it is important to put those images together in your mind and put the atmosphere into motion. *When looking at a 2-D analysis chart or forecast panel, try to visualize vertical as well as horizontal synoptic motion. *Air rarely flows on a perfect horizontal plane, especially in the vicinity of low pressure cyclones. *Visualize how vorticity, thermal advection, and jet streaks will effect atmospheric motion in a 4-D sense. LOOK at analysis charts and try to visualize atmospheric motion in 4-D!! Memorization technique: both SRHEL and SWEAT values have nearly the same scale and meaning! b. Troughs and ridges not only build due to the thermal gradients but also because of jet streaks imbedded within the jet stream flow. RULE OF THUMB: If the jet streak is on the left side of the trough, the trough will deepen. If the jet streak is on the right side of the trough, the trough will lift. Vorticity is caused by 3 components which are shear vorticity, curvature vorticity and earth vorticity. Diagrams of each are shown below. Counterclockwise rotation in the NH results in positive vorticity while clockwise rotation results in negative vorticity. PVA and uplift occur with vort max that has a vorticity gradient nearly perpendicular to the height contours. PVA only occurs on the downwind side of the vort max. Just because the temperatures are hot or the dewpoint is high, does NOT mean a location is experiencing moisture or warm air advection. The average temperature of a layer of air must be increasing or the average dewpoints in a layer of air must be increasing through time. If warm air advection or moisture advection occurs at the surface, is will cause air to expand and thus rise. Therefore, two of the main synoptic scale lifting mechanisms are surface to 700 millibar warm air advection and moisture advection. a. Is global warming occurring? b. Does El Nino cause weather disasters? c. Does pollution harm human health and the earth's ecosystem? d. Does a warmer than normal winter mean there is going to be a warmer than normal summer? e. Are hurricane and tornado frequency increasing with time? e. Do not become dependent on MOS data. Research NWS forecasts and discussions for validity.